SS Rajamouli said that Teja has managed to extract a solid performance from Rana Daggubati in Nene Raju Nene Mantri. The much-loved SS Rajamouli recently took to Twitter and praised director Teja for delivering a good film in ‘Nene Raju Nene Mantri’. He went on to add that the director had managed to extract a terrific performance from Rana Daggubati and done full justice to his talents. “Nene Raju Nene Manthri. Dealt with great finesse by Teja garu.. Superb performances by every actor.. So proud of my Bhallaladeva. A meaningful film after a long time. Congratulations team #NRNM,” he added. Rajamouli also praised the film’s leading ladies and said that they had done complete justice to their roles. “Kajal (Aggarwal) is so good. Catherine (Tresa) too. Arresting opening sequences and the unexpected climax twist are the best parts,” said the ‘Baahubali’ director. We are sure that Teja and co will be quite thrilled to receive such compliments from a filmmaker of Rajamouli’s stature. In case you did not know, ‘Nene Raju Nene Mantri’ is touted to be a political-thriller and features Rana is a raw new avatar. Released on August 11, it received the proverbial thumbs up from fans thanks to its gripping performances and engaging plot. It is Rana’s third release of the year. He was last seen in ‘Baahubali 2’ which set the box office on fire. Directed by Rajamouli, it featured him in the role of the heartless antagonist Bhallaldeva. Before ‘Baahubali 2’, he was seen in the war-drama ‘The Ghazi Attack’. Also featuring Taapsee Pannu and Kay Kay Menon in the lead, it received rave reviews upon release. 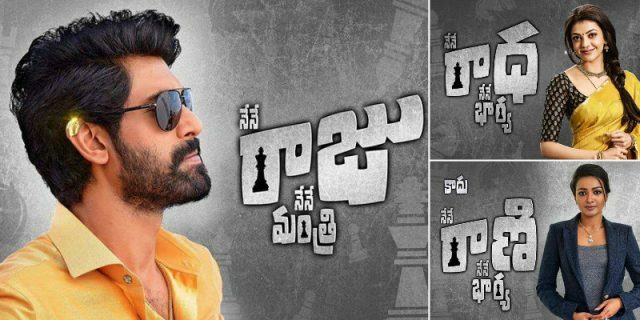 So, did you watch ‘Nene Raju Nene Mantri’ FDFS? Comments, please!